Trumpeter’s LAV-AT is the first non-tracked armor that I’ve built, and was definitely a nice, simple introduction to things with entirely too many tires. The kit itself is competent, solidly detailed (I wouldn’t call it “great” or “exquisite”) and simple. There’s no interior to speak of, and even some parts where you’d want a bit more detail and complexity – like the turret windows on the Emerson Hammerhead launcher – are overly simplistic. The vinyl tires the kit ship with look really great – until you go to put paint on them and watch in horror as the paint flakes off the second you put any kind of pressure on them. Do yourself a favor and spring for resin replacements. While you’re scoring aftermarket – there’s basically none for the LAV-AT – but you will want to track down AFV Club’s Anti-Reflective Coating sheet. It’s for all Trumpeter LAVs, and considering Trumpeter couldn’t be bothered to supply clear parts for the various periscopes and vision blocks, the AR film goes a long way to fixing the look. Overall? This kit falls pretty short of the latest and greatest. 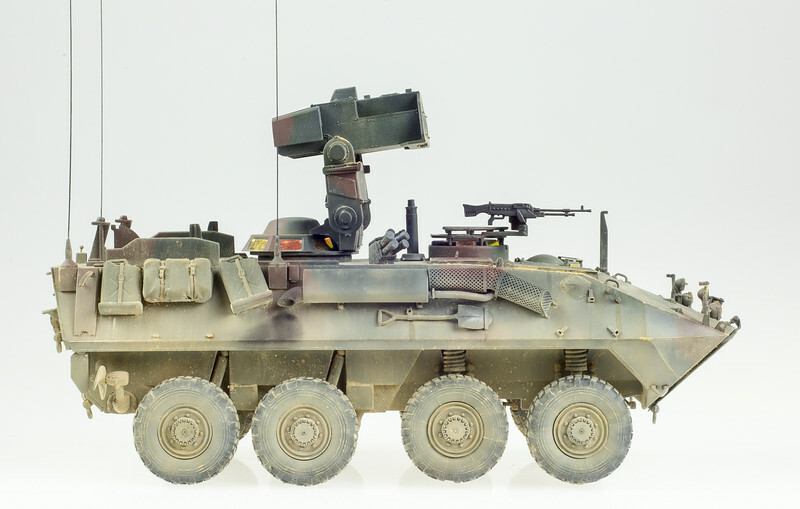 Next to Trumpeter’s T-80BV, the LAV-AT looks like a dog. But it’s cheap, and it builds up well enough. If you’re looking for a break from things with tracks, it’s an excedlent respite. i am trying to re-start the hobby again so i have buying armor vehicles by reading reviews so i did but i started working on the Tamiya’s M51 because i am interested in the Yon Kipper war of ’67 but i found that it was not that easy as i thought so i stopped doing should i continued it .yes or no ? What about it wasn’t as easy as you thought? Tamiya’s Sherman kits have a pretty solid reputation and build quickly, but I haven’t built the M51 or their newer HVSS-suspension Sherman kits like the Easy Eight.